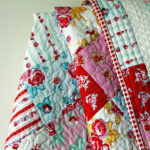 Sometimes I think I deliberately go slow when I am quilting. I’m not sure if it’s because I am prolonging the joy of hand quilting, or it’s because I can’t decide on what quilt pattern to do next. Either way, Moon Shadow is coming along very nicely. 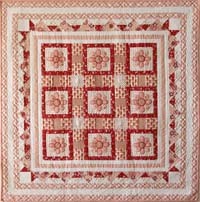 On this quilt my preferred quilting method is a long stitch using a double strand of Mettler silk-finish multi cotton thread. 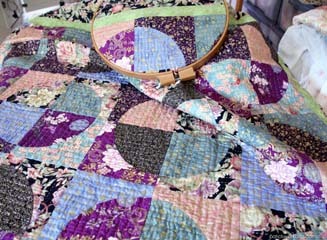 It isn’t strictly a quilting thread, but I am a rebel, and I love the variegated colours. I have stitched in straight lines, half an inch apart all over the quilt. The contrast of the straight lines with the curves of the blocks is pleasing to my eye. My preferred needles are Clover Black Gold Quilting Betweens No 12. Word on the street is that they are 30% faster. I can’t say for sure that they are faster, but they do grip beautifully and, I feel I have more control over the stitch length. These needles, my super-sharp scissors and my beloved thimble are all the tools I need to keep quilting on a winter’s afternoon – even if I am going slow. 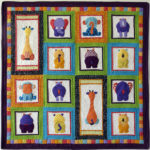 Moon Shadow Quilt Pattern is now available! Helen, This is gorgeous! Well done. Thank you, Deborah. This quilt is bringing me great joy.